Portrait of Lancelot ‘Capability’ Brown, c.1770-75, by Richard Cosway (17421821)/Private Collection/Bridgeman Images. Brown was certainly a prolific designer, and he seems to have worked just about everywhere in England, so part of the current attention is focused on exactly where he did work or where he simply advised and let his followers do the work. If Queen Elizabeth I is supposed to have slept everywhere, Brown has acquired his almost mythic stature as the landscape designer of the natural garden by establishing them all over the land. Research on establishing his oeuvre—exactly where and to what extent did he work on a given site—is a work still in process. And as we now, somewhat astonishingly, know that he had something of a following in Europe, Russia and the United States, his status as the preeminent English gardener has acquired a slightly different aura. 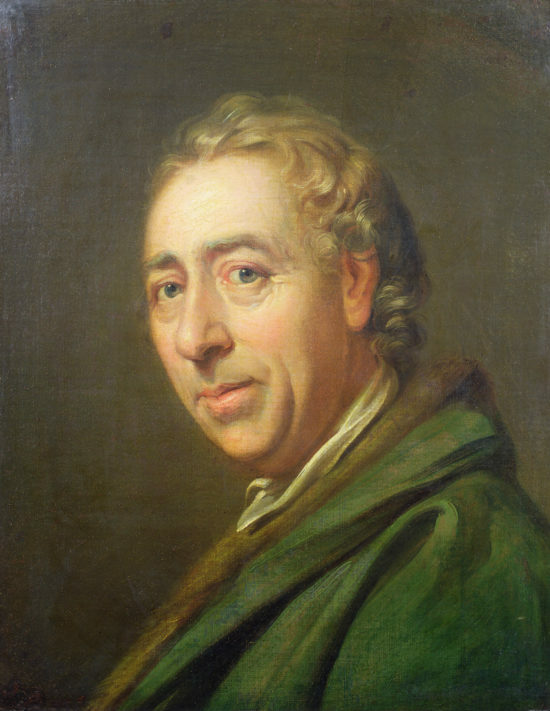 So while we now are learning much more about “Capability” Brown, we know (I think) less about how to explain his landscape gardening and how it figures, then and now, in our narrative of gardening. It is strange that for all the admiration of Brown, he has never found his work adequately explained. It is tautologous to claim his works are “thoroughly Brownian” or in a “Brownian character” (one cannot define Brown by using the definition you wish to explain! ); though that explanation maybe explains that we want to see him as different from others. He was not picturesque, though some have tried to see him as that by linking him to a prominent aesthetic of the late eighteenth century. That did not prevent artists from being able to depict his landscapes in “pictures” that we much admire; in those images we are paradoxically vouchsafed a view of his best work in ways that he would himself not have recognized as picturesque. He was clearly not like his predecessor, William Kent, whatever Horace Walpole said about how much they performed in the same way. After Brown’s death, Humphry Repton, who deliberately wished to inherit his mantle, followed awhile in his best footsteps but soon afterwards found his own way with his clients; nor did Brown’s co-designers and those, whom David Brown and Tom Williamson call “his men,” necessarily exhibit the same qualities that so marked his best work. So how can he be given a just and properly apt critical appraisal? He is far too important a figure in the narratives of landscape architecture to be left to fend for himself. I argued during a brief talk in 2016 that Brown was a neoclassicist, which I still believe is a useful way to understand him; but the claim needs more extensive and analytical support. Dorothy Stroud uses “neo-classicism” just once in her book, when noting that Brown, in his design for Claremont, had shed his Palladianism “in favour of neo-classical proportions.” Yet the term is neither an ideal nor an obvious description, for that art historical term was a nineteenth-century invention that sought retrospectively to describe late eighteenth-century arts (in the plural), and we risk tripping over the complex cluster of its agenda if we commit ourselves to it uncritically. a good plan, good execution, a perfect knowledge of the country, and the objects in it, whether natural or artificial, and infinite delicacy in the planting etc., so much to produce an effect of light and shade so very essential to the perfecting a good plan; as also hiding what is disagreeable and shewing what is beautiful, getting shade from the large trees and sweets from the smaller sorts of shrubs etc. He also noted that such a work should “exactly fit the owner, the Poet and the Painter.” If he invoked the role of a painter, it is as much his own delight in the patterns of light and shade in a landscape, as a gesture to the picturesque; furthermore, he asked that his work be “fit” for a painter, a suitable subject for one, but not in itself painterly. But far more crucially, he emphasized the need and importance of a plan; rarely did he offer his designs in images of scenery—in this unlike Kent, who produces sketches and from whom we have perhaps only one plan. There was much appeal during the eighteenth century to the role of the sister arts, by Walpole, Reynolds and Blake among others; even Brown gestures to “the Poet and the Painter.” But the lure of their collaborations often prevents us from seeing distinctions between them: the various arts differed in their modes of working, with different subjects, different materials, and often different audiences and kinds of reception. These differences must be observed. But it can be useful to situate Brown, himself apparently unconcerned to formulate theoretical or even practical advice, and find some possible exchanges between the arts of his time, for he was not at all an isolated artist. Yet we need, in effect, to cherry pick among the useful compo­nents of the neoclassical. The late Ian Hamilton Finlay, a modern advocate of his own neo-classicism, wrote that “Brown made water appear as Water, and lawn as Lawn.” That admirable aphorism takes us directly into the heart of Brown’s work with landscape elements. He learnt to give water, lawn, trees and rocks what Sir Joshua Reynolds called a “noble simplicity” or “the real simplicity of Nature.” This also suggests that his designs were already, in some way, in the shape he wanted to give them, and that waiting for their maturity mattered less to him. This appeal to simplicity was widely echoed, not always in contexts where it seemed à propos: William Mason begins his 1786 poem on The English Garden by aphorizing “divine SIMPLICITY” before moving to praise the work of how painters represent landscape. The word “simplicity” is endlessly echoed by European writers like Winckelmann and Diderot, who also wrote of “nature and antiquity, that is to say antiquity, strength, grace and truth.” Yet the antiquity for Brown was not that of Greece and Rome, nor the traditions of earlier gardens from Italy or France, but the antiquity of English nature as viewed by his contemporaries: namely their attention to local topography, the lie of the land wherever he intervened, geographical circumstance, archaeological and ancient British remains, and the aesthetic possibilities of British nature. Some of Brown’s friends assumed he would be “join’d to antiquity” but were disappointed: “I hoped [he] wou’d produce great things,” wrote one of them, “but Brown has sadly deceived me; for he has ruined old avenues, and not planted in their place, half enough . . . and there is no inequality of ground.” That was one comment among others that seems to suggest that what Brown wished to achieve was missed by contemporaries. The most famous skepticism came from William Chambers (though he was in addition a political adversary), when he wrote that Brown’s work was indistinguishable from the “common fields”; a similar remark, this from Walpole, “that he did so closely . . . copy nature that his works will be mistaken for it.” Yet given Walpole’s praise of Brown elsewhere, this suggests that Walpole at least did not mistake his designs for a merely copied nature. Brown’s neoclassicism was conducted in what Hugh Honour called a spirit of reform. The baroque and the rococo borrowed earlier from the European continent had obscured what was rational and stoic in the arts, and especially in the English landscape. Hence, Brown simplified his landscapes, played down the incidence and associations of sculpture and temples, and allowed the very materials of the art with which he worked to determine how his visitors would pereceive them. But it was as subtle as Finlay implied: capitals replaced lower case, but only if you saw them printed on the page. Otherwise, on the ground, visitors were obliged to grasp his transformations and rehearse this capitalization or that punctuation for themselves. Another, now contemporary account, came from Brown himself, and it too involves a subtle, even sly, cross-reference between the sister arts of garden­ing and writing: in his response to Hannah More, Brown explained his work as “‘Now there’, said he, pointing his finger, ‘I make a comma, and there’, pointing to another spot, where a more decided turn is proper, I make a colon; at another part, ‘where an interruption is desirable to break the view, a paren­thesis; now a full stop, and then I begin another subject’.” It was a clever way to emphasize, for a famous bluestocking, the lightness of his touch, the precise punctuation of his landscapes and the fashion in which he modulated the fundamental ingredients of his designs (his creation of new views, using single trees or clumps to guide visitors through the landscapes, helping them understand the rhythm of their visits). Among the sister arts of the eighteenth century, there were some parallels to be found between Brown and the work of other contemporaries. Given the austerity, the careful abstraction of his designs, best communicated then and indeed now by his plans (because they suggest his original vision of sites), there are similarities to the pure lines of Flaxman and the sinuous lines of Blake, rather than the drawings of Kent or Vanbrugh, or to the figures on Wedgwood’s jasper stoneware, which we know Brown admired. When Honour describes David’s Oath of the Horatii (1784–5) as a painting that pulls from the elaborate narrative of the classical event an “essence to reveal the inner meaning of the story” and presents the scene directly, with all the actors parallel to the viewers, not seen obliquely, and with no fussy decoration, he could also be pointing to Brown’s skill in placing before his visitors the essence or inner meaning of the scenery, which he (like David) manipulates. Like David or Reynolds, Brown thought his designs should be art (though, of course, Reynolds in his 13th Discourse to the Royal Academy was skeptical of that claim for landscape gardening). But the natural materials Brown needed to use in his landscape designs, while they could be shaped and assisted by those who helped him implement them, necessarily represented themselves. So his audience/users were less likely, less skilled, to appreciate how his landscape “poetry” was a “feigned” nature. Whereas other artists of neoclassicism thought that nature should not be copied and wished for an “intellectual dignity to ennoble the painter’s art,” the practice of landscape gardening was forced to accept that a nature was more closely copied than by other visual artists; you didn’t represent a tree, you used one. Inasmuch as so many of his ideas were presented in plan rather than sketches or views, that suggests how “copying” was not his mode of proceeding. His plans for such sites as Ingestre in Staffordshire from 1756 or that of 1763 for Lowther in Westmore­land were clearly formulated for their sites, with obvious invita- tions to explore them; the repertoire consists of trees, clumps, open clusters and more enclosed woodland, but at Ingestre avenues of trees leading away from the open expanse of lawn. Those touches of regularity imply a refusal simply to copy nature; but the clearly artificial representation of the design and the careful and deliberate lines of their drafting also deny any intention to copy nature. When translated onto their sites, of course, the artifice of the plans is necessarily softened by the very materials used, and of course any modulations of the ground that the plans do not imply are palpable. Depending on the assumptions that visitors bring to them, the landscape may present itself variously as constructed “nature” or simply nature. Where copying was, of course, readily avoided, was with painters who depicted Brown’s work and used their own intellectual skills to enhance his designed landscapes on their flat canvases or paper. It is some of the most perceptive painterly depictions of Brown’s landscapes that, along with his plans, register his understanding of that neo-classicism: the artist Francis Towne, who often abstracted land forms that he saw and represented in watercolor and drawing, painted the Brown landscape at Ugbrooke in the 1770s: even through this is an oil painting, both the water of the lake (in the foreground) and the slopes of lawn that fill the far distance are rendered with simplicity and muted color without much chiaroscuro. Yet it appears to be difficult to absorb designed (rather than painted) landscape gardening into adequate histories of the neo-classical. Robert Rosenblum’s Transformations in Late Eighteenth Century Art can use some images of buildings in landscape (by Claude-Nicolas Ledoux) and some few actual sites where again a building is prominent—James Stuart’s temple in Hagley park, or the Rustic Temple at Ermenonville; but Brown escapes his analyses entirely. And Hugh Honour, arguing for a landscape design that is suitably neoclassical, opts for Stourhead. Yet Henry Hoare’s landscape is nothing like Brown’s: its painterly debts to Claude, the cluster of buildings, grottoes, temples, gothic structures around the lake and up its valley, borrowed items from a market cross or a mediaeval pump, and the calculated historical references to King Alfred, sculptures in the Vatican collections, or temples from Baalbek—all these contrive a rich and busy experience which required visitors then and now to attend to its meanings and allusions. And it is perhaps no accident that Stourhead has become a favored destination of landscape enthusiasts and garden commentators, for it gives them opportunity to explain what they see. By contrast, visitors to Brown’s sites have far less to fall back on; hence their need to appeal to “nature” or “informality” or a tautological appeal to Brownism! One of the perennial issues regarding Brown was that he was and still is thought of “as being picturesque”; his foremost commentator, Dorothy Stroud, was unusual and absolutely right when she treats the picturesque as a later aesthetic whose proponents misunderstand Brown’s work. The picturesque experts usually relished an appreciation of fragments, fissures and deformities of nature, which Uvedale Price often celebrates in Three Essays on the Picturesque (1810). The way in which Brown has become tangled with the picturesque dates to the work of both Horace Walpole and William Mason, whose works overlap during the last twenty years of the eighteenth century (so much of this commentary comes after Brown’s death in 1783). The history of Brown’s enthronement as the great landscaper began with the indifferent and clumsy verses of William Mason in The English Garden and with an essay of Horace Walpole, whose wonderfully tendentious argument prevailed for much of the later eighteenth century and continues to seduce people today. Mason and Walpole were friends and clearly followed each other’s writings and publications. Part of the reason to wrap Brown in the picturesque mantle is that therefore he can be hailed as the final, glorious climax of “natural” gardening in England. In strains, the beauty of his scenes inspire. So Brown became the climax of a Whiggish narrative, in which landscape design aspires to the condition, if not of music, then of pure nature. For Walpole it was a simple matter: “The History of the Modern Taste in Gardening” made William Kent the avatar of the new style (that it was wasn’t entirely “new” did not prevent Walpole from ignoring a variety of early proponents of this “newness”). Originally written as part of Walpole’s four-volume history of British painting, there was a certain relevance in that William Kent, who features centrally in the gardening essay, was certainly a painter, though not a particularly good one. But when divorced from the context of a history of British painting to stand alone as an essay on English gardening, Walpole’s use of painterly language to describe Kent’s landscape work was read as a literal description of his gardening, rather than as an analogy, a way into understanding what was “new” without implying that Kent’s landscaping was itself painterly. Walpole envisaged the whole “face of the country” becoming “picturesque.” His metaphors are all drawn from the language of painting: Kent was “painter enough to taste the charms of landscape”; when he “felt the delicious contrast of hill and valley changing imperceptibly into each other,” he applied the “pencil of his imagination” to devising the landscape; or “an open country [being] but a canvas on which a landscape might be designed.” With “some particular thoughts . . . common [to] other painters,” Kent “made his hand known”—so any painterly connoisseur would be able to identify the “hand” of the landscape artist in his actual gardening! While Walpole’s focus was on Kent and his work as a painter in landscape, and not on Brown, Kent’s skill in grouping trees, parsing lawns and woodland anticipates some of Finlay’s aphoristic summary of the Brownian aesthetic. Walpole does include Brown briefly in this history as a “very able” successor to Kent; but as his original history of painting only focused on artists no longer alive, Brown could not take a central role, though Walpole hopes that “some abler pen” than his might “gain” him his deserved place. But his role is nevertheless briefly announced, and the process of his absorption into the Walpolean picturesque narrative cemented. Brown enters then into discussions of landscape gardening at precisely the moment when there was a flurry of writing on the picturesque, even though Uvedale Price and Richard Payne Knight found little to be picturesque in Brown’s work. Even Mason himself, writing about Humphry Repton in 1783, explained to another picturesque exponent, William Gilpin, that Repton “alters places on paper and makes them picturesque.” That perhaps declares more than Mason intended, an interesting slip: but as his Red Books make clear, Repton did indeed have a talent for presenting the scenery of parks as images, picturesque designs on paper, even if he had also the skill to realize them later on the ground; yet we have enough evidence that some of these charming renditions of scenery on paper were never imple­mented but featured on library tables as picturesque visions. There is, however, some room for a picturesque interpretation of Brown, which might provide a more comfortable way of thinking about him, though it is not premised on how a painter sees his material; but it would make sense of his endlessly intriguing explanation to Hannah More about his punctuation. It suggests that he valued movement through his landscapes, just as punctuation guides a reader through a sequence of remarks. This is the appeal made by Yve-Alain Bois in his discussion of whether Richard Serra’s sculptures are “picturesque”: that to get to know them properly we must attend to “deambulary space and peripa­tetic vision.” For we only really understand Brown’s landscapes by walking or riding through them; if this is “picturesque,” then it is more the video or the movie, not the photograph nor the static drawing that determines his art. This is not to say that many early gardens were also best explored by ambulation—witness Louis XIV’s guides for how to visit the gardens of Versailles. But increasingly, and with Brown supremely, it was only through a careful attention to and exploration of his parks that a site was fully known and appreciated. To isolate the ideal world of nature within them, as visitors moved from the larger agricultural land outside his signature belt of trees and then continued to explore his Lawns and Valleys, walked beside his Waters, mostly unham­pered by iconographical prompts and triggers in the landscape, they needed to pay attention to the “natural” materials. And that perhaps was also why many found Brown’s landscapes harder to read. So there is a certain paradox about Brown. That he has been hailed as a distinctive exponent of “nature” and “English” landscape sits uneasily with a view of him that positions him within a European neoclassicism. But this is where an appeal to a picturesque that privileges movement is, perhaps ironically, useful in apprehending how a more careful role could be found for Brown in landscape history. In short, he used his own “punc­tuated” neoclassicism as a means of moving through and drawing out la belle nature of many English country seats. A dominant concern in the eighteenth century was to define, understand and promote an idea of Britain as an “imagined community.” Nationality, as Benedict Anderson argued in Imagined Communities, is notoriously difficult to define, but imagining a community such as Great Britain (as “a cultural artifact”) could promote new “modes of apprehending the world.” In the eighteenth century, Anderson argues, this apprehension was sustained by a combination of several forces in “print capitalism,” notably the novel and newspapers, that worked within societies to embed a sense of belonging and understanding, since they “made it possible for a rapidly growing number of people to think about themselves, and to relate themselves to others.” But another key force, especially in a relatively small country like Great Britain, was its landscape, and here too a considerable print culture was devoted to that subject, which in its turn helped to imagine the community that was Britain. If Brown did not use print to promote his landscape designs as others did (like Repton later), many noticed his works in their publications. Given that wars in Europe prevented many from embarking on a “grand tour,” it also pushed others, among those who could anyway not afford the expense to travel abroad, to explore Britain. And that in its turn promoted a huge new series of books on landscape to aid those English tourists whom Esther Moir discussed in The Discovery of Britain. Among these undoubtedly were books on the picturesque, in particular the Observations that William Gilpin published as he explored the different parts of England, like the two volumes of Observations relative to Picturesque Beauty, made in the year 1772, on several parts of England, particularly the Mountains and Lakes of Cumberland and Westmoreland. One of the best Gilpin Observations to reveal both his pictur­esque interests and his sense of Englishness, including a comment on Brown, is his first excursion down the River Wye, made in 1770, but only published in 1782, just one year before the death of Brown. It extended an understanding of one English region in some detail, focusing, of course, upon what tourists might view and depict rather than on how a site would have been or might be transformed. But during that tour he had visited one of Brown’s designs at Caversham House, where he noted that Brown’s “great merit lay in pursuing the path which nature had marked out.” Gilpin had initiated his own interest in landscape as early as 1747, when he wrote up his visit to the gardens at Stowe as a dialogue between two visitors; that was some years after Brown himself had started to work there and take his “path” through whatever “nature” had marked out for his designs. This double exploration of English garden landscapes by these two landscapers weaves similar yet distinct approaches. Gilpin wished to see how landscapes, mostly cultural, though occasionally designed, could be viewed and recorded visually, but also verbally. Brown eschewed verbal analyses of his designs, offering his transformations of land almost exclusively in plans and maps, leaving (as noted above) the depiction of his designed sites to others (which is how he acquired the label of picturesque, which was not his concern or motive). Gilpin, albeit theorizing about how picturesque landscapes should be conceived and repre­sented, was keen to review or “imagine” the actual possibilities in different parts of Great Britain as a way of collecting over the years of his tours and observations a compendium of English scenery, its associations and meanings; he was interested in the diverse communities of the whole country. Brown, though necessarily attentive to client needs and local material circumstance, wanted to reveal the essence of a site as it could be seen to rise above local circumstance. In pursuing “the path nature has marked out,” he wished himself to focus on the timeless gener­ality of nature’s “central forms.” That would raise any specific landscape to a higher, more abstracted level: ideals of nature, not specific and local forms, but (what the English language does not readily translate) la belle nature. Such idealized nature may take away the “character of complexity” (spoken by the anarchist in Conrad’s Secret Agent); but that is precisely what the gardens before Brown had not been able to achieve, and it was his forte to propose. And that seems to be the paradox. Brown was, clearly, attentive to the landscapes of his English clients—indeed, we know that he refused to work in Ireland as he “had not yet finished England.” But he also acquired a clear and quite austere ambition to make English nature more universal, which as Honour argues was linked to a patriotic desire to aggrandize the arts of his time and place. That Brown’s design vision after his death ceased to find approval or enhancement of his neoclassical approach is yet another chapter of the landscape narrative. That narrative con­cerns Repton, J. C. Loudon, and a bewildering array of talented designers during the nineteenth century, along with their need to attend to new social and aesthetic appeals. The later history has not enabled our ability to see Brown very clearly and allows him to be described in ways that fail to capture his extraordinary greatness. The major book referenced is clearly David Brown and Tom Williamson, Lancelot Brown and the Capability Men: Landscape Revolution in Eighteenth-Century England (London: Reaktion Books, 2016). Other items include are Tim Scott Bolton, A Brush with Brown (Wimborne Minster, Dorset: Dovecote Press, 2016); Sarah Rutherford, Capability Brown and His Landscape Gardens (London: The National Trust, 2016). Small book(lets) are Peter Brimacombe, Capability Brown (Stroud, Glos: Pitkin, 2016), Steffie Shields, Moving Heaven et [sic] Earth: Capability Brown’s Gift of Landscape (London: Unicorn, 2016), Beverley Howarth, Capability Brown in Kent (Maidstone: Kent Gardens Trust, 2016), and Emma, Duchess of Rutland, and Jane Pruden, Capability Brown & Belvoir: Discovering a Lost Landscape (London: Nick McCann Associates, 2015). The journal of The Gardens Trust, Garden History, will publish the texts of talks given at Bath in September at the ICOMOS conference, with its focus largely, and surprisingly, on Brown’s “influence” outside England. Essay from the Winter 2017 issue.